Port Townsend's strategic location at the entrance to Puget Sound made it a port of entry and an active trade city in the late 19th century. 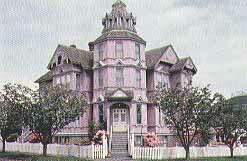 Because Port Townsend is one of the oldest cities in the state, there are numerous examples of Victorian architecture, complete with turrets, towers and Carpenter Gothic trim. Port Townsend is one of only three Victorian seaports in the United States on the National Historic Register. Port Townsend is the county seat of, and only major center in, Jefferson County.